Parkinson's disease is a progressive neurodegenerative disease for which there is no cure. April is Parkinson's awareness month, a time for raising public understanding about a disease that affects one in 100 people over the age of 65, translating to millions worldwide who are currently facing the daily challenges this illness brings. Dr. Soania-Mathur Family physician living with Parkinson's Disease, Founder of Designing A Cure Inc. Despite the great strides in past decades in our knowledge of this illness, there are many myths or lack of information about Parkinson's disease that remain. (1)	"If I have a tremor, I'll see my doctor and get tested for Parkinson's." Parkinson's disease is still a clinical diagnosis. That means that when you are diagnosed with PD, you are given that diagnosis based primarily on the physician's clinical exam and your account of your symptoms. Unlike diabetes or high blood pressure or even cancer, there is no definitive test such as a blood test or imaging study for Parkinson's disease. Lack of a marker interferes with early diagnosis, makes the diagnostic process that much more difficult, prolonged and questionable and significantly affects the development of better treatments and potential cures..
(2)	"I'm not at risk, I don't have a family history of Parkinson's disease." Only about 14 per cent of people affected with PD have a first degree relative (parent, sibling or child) that is also living with the disease. The vast majority of cases are what we call sporadic with no identifiable cause and no family history. (3)	"He got Parkinson's last year." Actually by the time a person begins to experience the symptoms of Parkinson's disease, 60 - 80 per cent of the cells that produce a chemical that is necessary for normal movement, dopamine, have died. 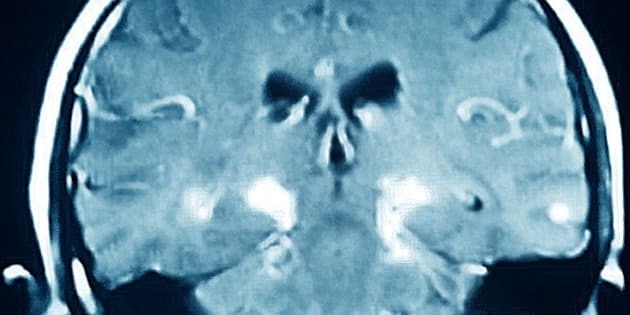 So the process that causes Parkinson's, likely begins years before patients experience the disease. And so far, we have no way of regenerating these cells. (4)	"Parkinson's disease is a disease that affects the elderly." Although celebrities like Michael J. Fox and former NBA player Brian Grant have put a young face to this disease, the prevalent view that this is a disease affecting the elderly, still exists. It is true that the majority of individuals are diagnosed with Parkinson's after the age of 60, but this illness affects younger people as well with 20 per cent diagnosed under the age of 50 and 5 - 10 per cent under the age of 40. (5)	"They know what causes Parkinson's disease." Unfortunately this is not true. The actual cause of this illness remains a mystery. We know that a lack of one of the brain chemicals or messengers, dopamine, causes some of the symptoms but not all. And we know that the cells that produce dopamine die in part of the brain called the substantia nigra. But what we don't know is why these cells die or why other symptoms that are not related to lack of dopamine, exist. (6)	"People with Parkinson's mostly have trouble with their movements." Once thought to be primarily a movement disorder that was defined by the cardinal symptoms of tremor, stiffness and slowness, we now know that this disease is much more. This is a pervasive illness and it affects many body systems causing a diverse array of symptoms such as constipation, incontinence, sexual dysfunction, sleep disorders, visual changes, depression, anxiety and even skin changes to name a few. These non-motor symptoms as they are known, actually contribute to poorer quality of life than the motor aspects of this disease. And unfortunately, they can be more difficult to treat, many not responding to conventional Parkinson's medications. (7)	"Everyone with Parkinson's experiences the same symptoms." I've heard it said that when you meet one person with Parkinson's, you've met one person with Parkinson's. In other words that one individual's experience cannot be generalized to others diagnosed with the same illness. People with Parkinson's differ in terms of the time of their diagnosis, their symptoms, the course of their disease, their response to medications, their quality of life and their prognosis. There are some similarities but also a vast amount of variability within the Parkinson's population. (8)	"You die from Parkinson's disease." Complications resulting from Parkinson's disease such as aspiration pneunmonia or a severe fall can result in a shortened life span but the disease itself will not lead to an early death. However the same cannot be said about disability and the need for extra care resulting in a significant societal and healthcare issue, particularly since the number of people diagnosed with this disease (currently approximately one-million Americans) is predicted to double in the U.S. by the year 2040 as the population ages. (9)	"There are lots of medications to treat Parkinson's disease." There are a number of medications to treat Parkinson's however the gold standard treatment for this illness was developed almost half a century ago. Levodopa was found to be an effective treatment for the motor aspects of the disease over 50 years ago in the 1960s many years after James Parkinson in 1817 wrote about a constellation of symptoms that today we know as Parkinson's. And unfortunately levodopa is not without its limitations both because it fails to address all the symptoms, it tends to be less effective in advanced disease and also because it can cause significant side effects for some individuals. But it is still the drug that any other new medication is compared to when judging effectiveness. (10)	"The cure is around the corner." Due to the lack of clear understanding of the cause of this disease, the lack of a biomarker, the challenges that research faces, the search for better treatments and a cure is a difficult one. However that doesn't mean that there is no hope for the future. Undoubtedly there is much exciting and forward thinking research coming down the pipeline in the search for better treatments and a cure but there are no imminent answers. Parkinson's disease is an illness that affects the quality of life of millions of people around the world. And as our population ages, it will become a challenge that millions more will likely face. How can you make a difference? Contribute to the search for better treatments and a cure by raising money for research, participating in clinical studies and raising awareness so that others may do the same. By working together we can make a significant impact that has the potential to change the advancement of this disease.